As the 1963 National League season moved into its fourth month, the Milwaukee Braves visited San Francisco for the second time. On July 2, San Francisco sent 25-year-old Juan Marichal out against Warren Spahn, 17 years his senior, in the Tuesday night opener of a three-game set. The Giants’ starter was looking to avenge a 3-1 loss on April 28 to the antediluvian left-hander, pitching in his 19th major league campaign. The Giants were in third place, 1½ games behind the top-seated St. Louis Cardinals, while the Braves were a .500 ball club, sixth, 6 ½ games back of St. Louis. Marichal had won 12 games in 15 decisions for his team, and Spahn was sporting an 11-3 record for 38-38 Milwaukee. At slightly past eight o’clock, Marichal took the Candlestick Park mound. Four hours and 15 innings later, he was still toiling there. And so was Warren Spahn–in a scoreless pitching duel. The Braves had mounted a serious scoring threat in the top of the fourth inning. Marichal disposed of the first two batters before trouble arose. The right-hander walked Norm Larker, and Mack “The Knife” Jones followed with a single to left, moving Larker to second. Del Crandall hit a soft single to center that Willie Mays caught, then lasered to the plate to nail Larker trying to score. It had been a charmed half-inning for the Dominican pitcher. Henry Aaron led off the frame with a drive to deep left field that Marichal said, the next day, he thought was gone.1 Willie McCovey hauled the ball in a few feet from the fence, as Candlestick Point’s strong westerly winds knocked it down. “I followed the ball all the way out but evidently the umpire didn’t. It was at least three feet fair when it left the park. I think the umpire was watching where it landed and made his call on that. As hard as I hit the ball it didn’t have a chance to curve before leaving the ball park,” McCovey said after the game.3 When he stepped back into the batter’s box, a miffed McCovey grounded out to first base, with Spahn covering. After a two-out single by Felipe Alou, Orlando Cepeda popped up to third base, and the scoreless game moved into extra innings. With two outs in the top of the 13th, Braves’ second baseman Frank Bolling singled off Marichal, ending a string of 16 batters in a row retired by the Giants’ workhorse since a walk to Aaron in the eighth. Bolling was left stranded by the next hitter, Aaron, who popped up to first baseman Cepeda in foul ground. Marichal was scheduled to bat third that inning. Cepeda later recalled the moment in a 1998 memoir. Manager Alvin Dark asked Marichal if he had had enough. Cepeda remembered Marichal barking at Dark, “A 42-year-old man is still pitching. I can’t come out!”4 Dark accepted — or was startled into acceptance by Marichal’s ardor — and let him bat. Marichal flied out to complete the inning, and the game pushed forward. The Giants made a strong bid to get Marichal a win in the lower half of the 14th. With two outs, they loaded the bases on a double, walk and error by Denis Menke, in at third base for Eddie Mathews. But Spahn then coolly retired Giants’ catcher Ed Bailey on a fly to center, ending the inning and extending the deadlock. In the 16th, Marichal allowed a two-out single to Menke, and then registered his 48th out of the night on Larker’s comebacker to the mound. It was Marichal’s 227th pitch. When the Giants hit, Spahn retired Harvey Kuenn on a fly out. That brought up future Hall of Famer Mays, still hitless on the long night. Now, Mays drove Spahn’s first pitch through the teeth of the wind in left. The ball cleared the fence, and with that, a masterfully-pitched game dramatically ended. Marichal was the exhausted victor; Spahn, the valiantly defeated. Over the 16 innings, Marichal allowed eight hits and four walks and struck out 10. Spahn, who threw 201 pitches of his own, yielded nine hits, walked only one (intentionally), and fanned a pair. Both men made their next scheduled starts five days later, the Sunday before the All-Star Game. 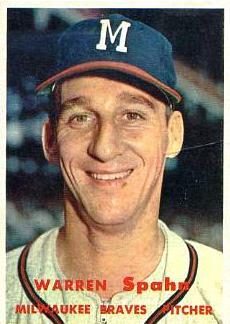 Spahn complained of a sore elbow, which apparently flared up enough to cause him to miss two starts later in the month, but he pitched through it to lead the 1963 National League with 22 complete games. Keri, Jonah. “The Greatest Pitching Duel in Human History,” Grantland.com, July 9, 2013. 1. Curly Grieve, “Juan, Spahn, All Agree: ‘Twas Terrific Game,” The San Francisco Examiner, July 4, 1963. 2. Curly Grieve, “Willie Knew His Blast Was Homer,” The San Francisco Examiner, July 3, 1963. 4. Orlando Cepeda and Herb Fagen, Baby Bull: From Hardball to Hard Time and Back (Dallas: Taylor Publishing Company, 1998), 93. 5. On August 13, 1954, Jack Harshman of the Chicago White Sox defeated Al Aber of the Detroit Tigers, 1-0, in 16 innings at Comiskey Park. Both pitchers went the distance. Harvey Kuenn was the Tigers’ shortstop. 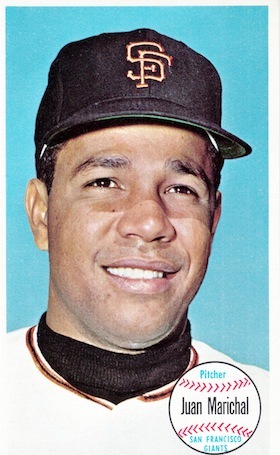 Nine years later, Kuenn was the Giants’ third baseman behind Marichal. The infielder played the entire way in both marathons. Two seasons after the Marichal-Spahn classic, the Phillies’ Chris Short and the Mets’ Rob Gardner locked up in a scoreless duel for 15 innings on October 2, 1965, at Shea Stadium. Both pitchers retired after the 15th, and the game (the second of a doubleheader) ended in a 0-0 tie after 18 innings, halted by curfew. Baseball-Reference.com., The Sporting News, October 16, 1965. 7. On September 1, 1967, Marichal’s teammate Gaylord Perry started and pitched 16 scoreless innings at Crosley Field–the last time a pitcher has thrown that many innings in one game. Goose eggs galore reigned in that one, which lasted 20 scoreless frames before the Giants pushed across a run in the top of the 21st to take a 1-0 victory. Baseball-Reference.com. Perry, a right-hander, said the next day he had to comb his hair with his left hand because he could not lift his other arm. The Sporting News, September 27, 1967. Five days later, though, Perry had no trouble with his arm. He pitched a 2-0 shutout in his regularly scheduled start against the Houston Astros. Baseball-Reference.com. 8. Jim Kaplan, “The Best-Pitched Game in Baseball History: Warren Spahn and Juan Marichal,” The National Pastime, No. 27, 2007.